Addressing election meetings at Babademb in Khanyar and Kangan in Ganderbal, Abdullah said people have to vote for preserving the country's secular disposition, integrity and unity. 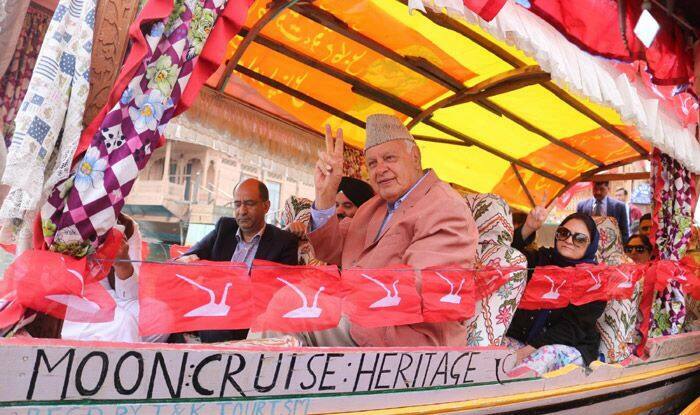 National Conference (NC) president Farooq Abdullah on Saturday said this parliamentary election will decide whether Jammu and Kashmir will be “able to remain a part of the Union with dignity”. Addressing election meetings at Babademb in Khanyar and Kangan in Ganderbal, Abdullah, who is contesting from Srinagar Lok Sabha seat, said people have to vote for preserving the country’s secular disposition, integrity and unity. “This election shall decide if the state of Jammu and Kashmir is able to remain a part of the Union with dignity. The people of the state are directly fighting the BJP and their cronies here through ballot for the protection of their identity,” he said. “This election will decide if we are able to live with our neighbouring country in peace. The general elections are also significant since it is a direct fight between falsehood and truth. However, no matter how much they try, falsehood is bound to perish,” the NC president said. “So, it is imperative for all of us to make our choice correctly,” he said. “He is a failed prime minister of a failed government. He has failed on every conceivable matrix. Not to talk of his promises which he made in the run-up to the 2014 elections. He has put into abyss what good was achieved by the previous government. “Why is he (Modi) shying away from answering what he was able to achieve during his stint in power? The other day, Congress leader Kapil Sibal revealed a Rs three lakh crore currency racket involving the BJP. Not just that, people are seeking answers from him (prime minister) on Rafael deal,” Abdullah said. He accused Modi of “flaring up” tension with Pakistan to “hide his misrule”, and sought an inquiry into the Pulwama terror attack that claimed the lives of 40 CRPF personnel. “I earnestly insist a thorough inquiry into the incident that killed 40 CRPF men on the Jammu Srinagar highway. Unfortunately, PM Modi is milking the post-Pulwama situation and Balakote (anti-terror airstrikes) to extreme levels to hide his misrule and misgovernance. However, he cannot befool the intelligent masses of the country with his sophistry and gimmickry. He stands no chance,” Abdullah said.